A 29-year-old man maliciously broke a window of a house after he left an adjacent pub in High Street, Eyemouth. Christopher Paterson, 29, of Queens Road, Eyemouth, pleaded guilty at Jedburgh Sheriff Court to causing £100 worth of damage on July 10. Procurator fiscal Graham Fraser said: “There was no rhyme or reason behind this, apart from the consumption of alcohol. “He had been in the pub and there was a carry-on with other people. As he left he broke the panel of glass in a neighbouring house at 1.15am which caused alarm to the lady owner. She contacted the police and CCTV proved to be of an assistance in identifying the accused. Ross Dow, defending, said the father-of-four had far too much to drink. He added his client was not working at the moment and received £120 a month Jobseeker’s Allowance. Sheriff Peter Paterson ordered him to pay £200 compensation to the female house owner for the damage and also “the shock and distress” caused. Paterson is due to stand trial on July 11 for three alleged offences at the Newcastle Arms in Coldstream High Street on March 9, including spitting in the face of a female employee. 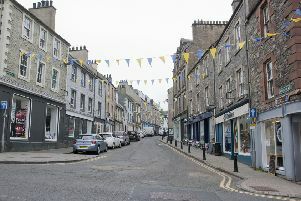 Co-accused Greig Pole, 27, of Duke Street, Coldstream, faces a charge of threatening or abusive behaviour.